Torso pitch: -24° to +40° while standing. -24° to +50° while crouching. The Thor (Clan designation Summoner) is a low-cost Clan Heavy Mech designed around straightforward weapon packages. Combining high armor with high speed and maneuverability with its integrated Improved Jump Jets, the Thor's various configurations are well suited for a variety of engagements. 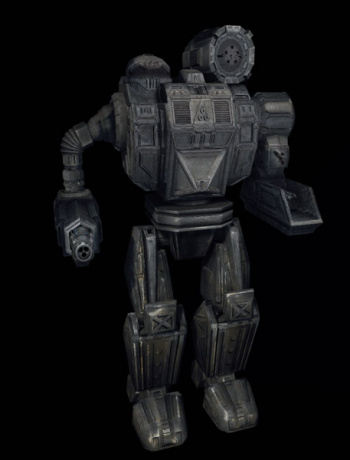 While it may mount less overall firepower compared to other heavy Clan Mechs, the Thor is still a significant threat, and a pilot can compensate for any lowered firepower by using the Thor's exceptional maneuverability to his advantage. The Thor variants are very limited on electronics, however, so pilots would do well to remain in Passive Sensors unless radar use becomes absolutely necessary. All Thor models mount their strongest weapon in their left arm, and have more armor on this arm than on the right one. The Thor arms lack articulation, however, and the free-reticle aiming mode does almost nothing for the unit. The Thor Prime maintains a simplistic load-out designed to engage targets at long to mid range. A cERPPC is capable of hitting targets up to 900m away, and the cLRM5s can reach even further out, while a cLBX10 delivers solid support over all ranges of engagement. Recent engineering corrections replaced the cLBX20 with the 10, allowing the prime to finally deliver all of its weapons within the same range bracket. 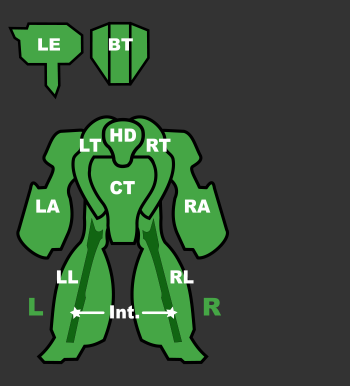 However, the result is that the Prime is decidedly more long-range focused, doing particularly well at anti-air roles. Its 2 free tons can be used for both cLBX10 and cLRM, whatever the pilots prefered engagement will be. Equipped with iJJ it's capable of manoeuvring over rough terrain, controlling engagement range and jumpsniping. Its 6 DHS do a good job of dissipating heat, but the spikes its bigger weapons cause must still be respected. This Summoner is an skirmisher with a firing solution for any range 450m out to 900m, the main hitting fist being the overwhelming CDSSRM6, in the shortest range. Most of it's weapons come to bear at 600m, so it can be used for jump sniping in the medium range, saving it's main blow for the unlucky opponents who try deal with is toe to toe. It's only 5 DHS might be heavily taxed by the extended range lasers and the hot ultra auto cannon if used in accord with the Improved Jumpjets. Despite sporting extended optics, and lacking any ECM, this unit is can tap into it's full potential only with active radar and in close range. Use with utmost care. Focused on providing long- and medium-range fire support, the B variant employs a single Hyper Assault Gauss/30 - which can reach out to 1200 meters - as its main gun, whose effectiveness is augmented by the inclusion of EOptics. For anything that gets closer, the B can unleash a punishing combination of an Heavy Large Laser and a Standard Advanced Tactical Missile-9. Two free tons for ammunition allow this variant some battlefield longevity. Despite the rather large potential damage output this variant possesses, it is not without flaws. While considerably shorter ranged than the LRM5s of the Prime, the Standard ATM9 also has a minimum effective range, which pilots must keep in mind. Additionally, the HLL builds a lot of heat when used in conjunction with the other weapons, and repeated use is not recommended. Fortunately, the Improved Jump Jets help to maintain distance from enemies as well as traverse difficult terrain, since ideal engagement range is at ~500m. While 5 Double Heat Sinks keep heat levels fairly manageable. Like the Prime and the E, the Thor C's weapons package focuses on a specific range of engagement; unlike the E variant, the C is mainly designed for medium to close-range fighting. To this end, the Thor C mounts dual DSSRM4s and a CLBX10. It has 5 extra tons of ammo for extended deployments. Pilots can chain-fire the DSSRM4s, rocking the aim of opponents with screenshake while peppering them with the CLBX10. Re-engineering has also favored this variant, receiving EOptics and a NARC launcher which are welcome additions for friendly long-range fire support units to rain down missile storms on enemy narced mechs. Single B-Pod helps deal with enemy Battle armor. Mounting Improved Jumpjets for maneuvering, the Thor C has 4 DHS to keep its relatively low heat generation in check. A new take on the popular long-range fire support role, the E variant has a straight forward and simple design. As usual, the primary weapon is mounted in the well protected left arm, in this case a Clan Gauss Rifle. Two cERPPCs round the unit out nicely, the shoulder mounted one is great for just peaking over a rise and fading back below, or using its improved jump jets to poptart, however a total of 8 heat sinks will be main limiting factor of the fire rate. A straightforward long range mech, the Thor F sports three cERLBL and a shoulder mounted ATM12(ER). Assisted by EOptics the unit is perfectly happy standing all the way back at the edge of 900m and blasting targets with its full firepower. Even further away, up to 1250m, its missiles can give anyone caught in the open a hard time. Extra 3 tons of ammo keeps the missile launcher well fed. Equipped with iJJ it's even capable of poptarting in cases it needs to stay behind cover. Its long range and high accuracy make it a very capable anti-air platform. But even with 8 DHS pilots will need to control the lasers' heat spikes with chain fire. A mid to short range brawler, the Thor G stands between the A and D in its ratio of alpha strike damage to dps potential, while generating enough heat to fry all three of them. From 600m in the variant can make use of its two HLL to deliver precise damage to enemies, giving it the ability to skirmish from further away. As soon as it enters close combat it can use its UAC20, arguably the most fearsome brawling weapon in the game, to pummel its target into submission. The unforgiving heat means that pilots will have to chain fire their lasers, and don't have much leeway to use them as long as their autocannon is still firing. Despite being equipped with Improved Jump Jets, it can be argued that it wouldn't handle the added heat. 9 DHS bring heat levels fast enough, to the point that especially maniacal pilots could even try jumpsniping. A heavy OmniMech with good mobility, the Summoner, dubbed the Thor in the Inner Sphere, has often been unfairly compared to the Timber Wolf (Mad Cat). The Summoner handles cleanly and conversely better than its seventy-five ton counterpart, while carrying less firepower. Its main weapons load out (LB-10X AC, ER PPC and LRM 15) gives it hitting power at all ranges, but little staying power once the ammunition runs out, a common trait to most of its base configurations. The 'Mech originated with the Jade Falcons, and remains a popular design in the heavy and assault clusters of the Falcon touman.